A group of students makes a trip to Tsunojima, near the coast of Kyūshū, home to a gruesome history. The mansion, build by famous architect Nakamura Seiji, was burned to the ground, but not before a terrible murder happened claiming his life and that of his wife. Until today the real circumstances surrounding this case have been unsolved and there are rumors, that Nakamura Seiji went insane and plotted the whole incident, roaming the island with blood lust on his mind to this very day. 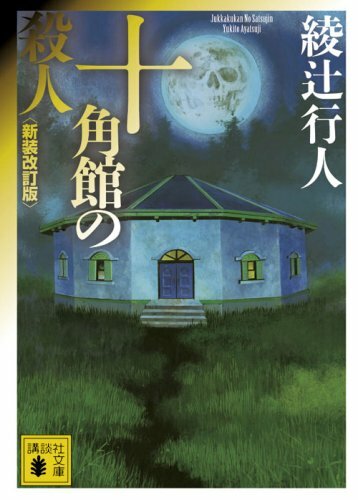 Now the mystery club of a renowned university plan to lodge themselves in the guesthouse of said Tsunojima, also build by Nakamura Seiji, right before his death. That is the famous jukkakukan, the Decagon House. Shortly after their arrival terrible murders start happening and the question arises whether Nakamura’s vengeful spectre is still roaming the misty nights on Tsunojima or if a murderer is among them. They start investigating the past, stumble upon secrets that will make them shudder and maybe, just maybe, a group of hobby investigators on the main island of Kyūshū is their only chance to ever leave the island again. This was Ayatsuji Yukito’s debut work and what was later to be coined as one of the inciting forces of the third wave in Japanese detective fiction. Here he also layed the groundwork of many things that would later become his trademark. It was heavily influenced by Shimada Souji, who he saw as something like an inspiration or a mentor, what he was to many authors of Ayatsuji’s generation. That he himself would become an influence on the genre was beyond his grasp and so he planned this work to be a stand-alone novel at first. Only after it’s release it became clear, that it was only the beginning of what would become his 館シリーズ and one of the big series’ of shin honkaku. What is clearly influenced by Shimada, is the separation into two plotlines. One on Tsunojima and the other on the mainland, yet both serve equally important roles to the plot and are fatefully intertwined, what only becomes apparent later in the novel. This would later become a trademark of Ayatsuji, but was also much smoother executed in following novels. Having read 占星術殺人事件 now it doesn’t seem as forced anymore, but the two plots are still a little bit too absolute for my taste. You can’t really call it a separation into story of crime and investigation like in Shimada’s case, but it is more a separation into two different crimes and two different investigations, that is only connected at a very small point. Of course it was important later on, because the mainland story explained many things about Nakamura Seiji that would later be used as common knowledge for the following novels. So I would say, as a beginning of a bigger complex, I see the importance of this novel and I had much fun reading it, but as a stand-alone novel it is a bit too contrived and forced at some points. Had it just been this one novel, I wouldn’t call it genius, but for what it created it really is important and interesting. The biggest disappointment for me was the solution to the case, because it felt so utterly forced and broke many rules that I saw as given for any detective novel. I won’t spoil the fun for you, but I felt like every guess I made earlier was useless anyway, because I would not have been able to solve it either way, a little bit like Doyle’s Speckled Band . ~ by seizonsha on 2010/07/25.